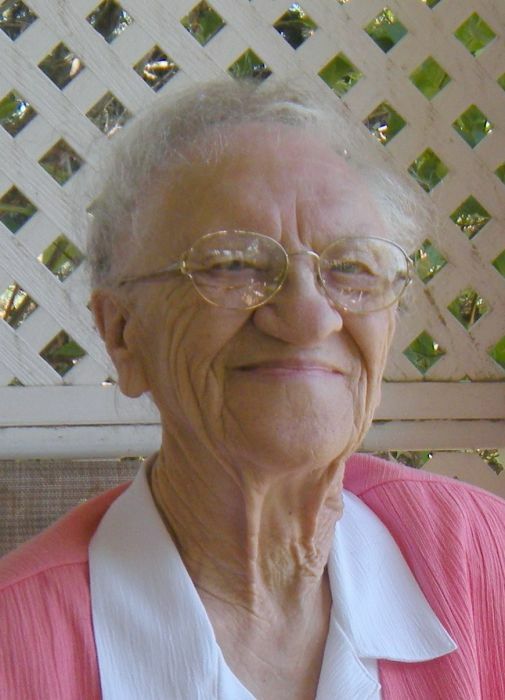 Katharina “Tiena” Hiebert (nee Teichroeb), age 102 years, 9 months, and 23 days passed away Wednesday, January 23, 2019 at the Herbert and District Integrated Healthcare Facility in Herbert, SK. Katharina “Tiena” Hiebert was born March 6, 1916 to Jacob & Maria (Klassen) Teichroeb in Blumenort, SK. One of nine children — she had four sisters and four brothers — she moved with her family to Blumenhof, SK in 1925 where they grew up on the farm. Tiena married Jacob K. Hiebert on July 4, 1937. They lived in Blumenhof until January 1997, when they moved into an apartment in Swift Current, SK where they lived together until Jacob’s passing in December 1998. Tiena moved to Riverview Estates in 2003, where she resided until 2014. She then lived at the Swift Current Care Centre for two months until she was transferred to the Herbert Care Centre in July 2014, where she remained until her passing. Tiena is survived by her son, Jacob (Elaine) Hiebert; her daughter, Leona Peters; her daughter-in-law, Evelyn Hiebert; her eight grandchildren, Barry (Maggie), Lori, Blake (Wendy), Carole (Cory), Jacqueline (Elwin), Kimberly (Mark), Dwayne (Linda), and Debbie (Trevor); her sixteen great-grandchildren, Brandon, Brett, Tyler (Alyse), Adam , Laine, Aiden, Devyn, Brooke, Shawn, Kaitlyn, Kennedy, Austin, Ryan, Justin, Treyton, and Trenton; her two great-great-grandchildren, Isaac and Carter; her sister, Sarah (Winkler, MB); and by numerous nieces and nephews. Tena was predeceased by her husband of 61 years, Jacob K. Hiebert (1998); her son, John Hiebert (1987); and by her son-in-law, Pete Peters (2016). Special thanks to the Herbert & District Integrated Healthcare Facility for the loving care Tiena received for the past four and a half years. The Funeral Service for Tiena Hiebert was held on Monday, January 28, 2018 at 2:30 pm from the Church of the Open Bible, Swift Current, SK with Rev. Martin Harder officiating. “What a Friend We Have in Jesus,” “Blessed Assurance,” “I Come to the Garden,” and “Because He Lives” were sung by the congregation under the leadership of Karan Regier, with Loreen Wiebe serving as pianist. Special music was brought by Adam and Tyler Ferguson. Tributes were given by Tiena’s grandchildren. The obituary was given by Kim Phillips. The service was concluded by a photo presentation. The ushers in the church were Carole Young, Debbie Ternes, and Cory Young. The Interment Service was held prior to the Funeral Service at 11:00 am from the Blumenhof Cemetery, Blumenhof, SK with Barry Hiebert, Blake Hiebert, Elwin Robertson, Jacqueline Robertson, Lori Ferguson, and Dwayne Hiebert serving as Pallbearers. In memory of Tiena Hiebert, donations made to the Herbert & District Integrated Healthcare Facility – Long-term Care Wing would be appreciated by the family.